At Shrinking Violet bespoke floristry in Malvern we don’t just do amazing, unique floral displays. We also put recycled tickets to good use! 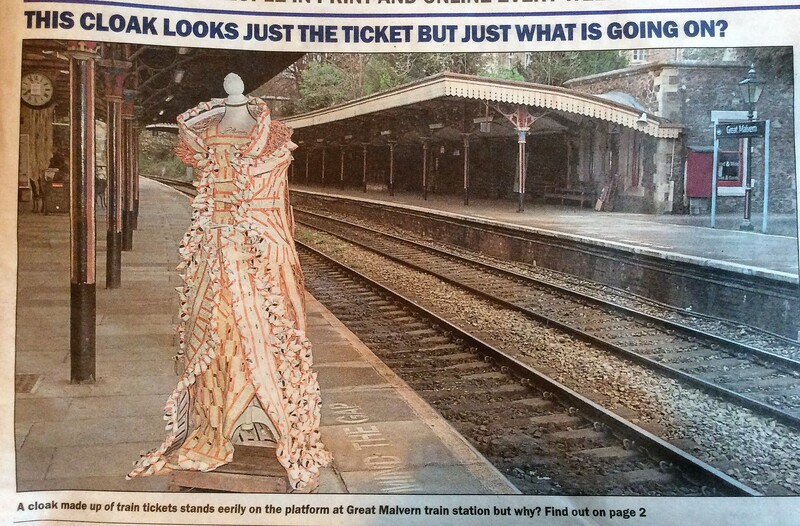 Lucy Jones was thrilled to be feature in the Malvern Gazette recently for her wonderful ticket cloak. 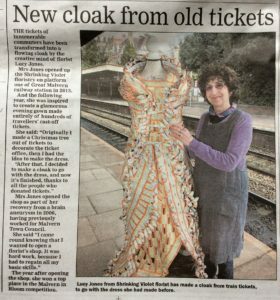 In 2014 Lucy created a beautiful gown from the donated train tickets she had collected at Great Malvern Station. She has now completed the outfit with this stunning cloak. We have lost count of how many tickets went into making the cloak and the dress, but the local paper described it as ‘innumerable’ and we think that’s probably pretty close! Since setting up shop at Great Malvern train station, Lucy Jones has also created a ticket Christmas tree and a hat for Royal Ascot.